A sign for the Donkin mine is seen in this image taken from video. HALIFAX -- Officials at an undersea Cape Breton coal mine broke a provincial regulation by not reporting a massive roof cave-in until government inspectors showed up 15 days after the first rock crashed down, according to provincial documents citing the firm for contravening rules last fall. 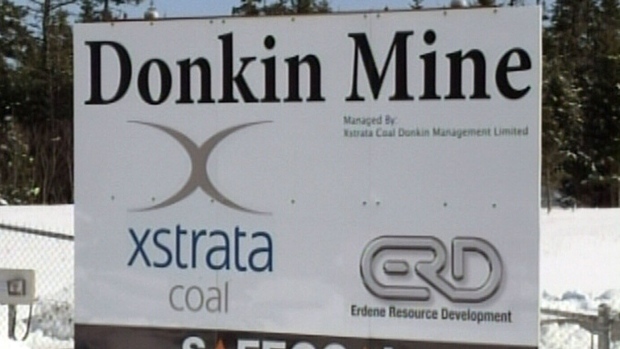 The managers of the Donkin, N.S., colliery also didn't initially report a second, Oct. 1 cave-in until provincial officials arrived two days later, the documents say. "When questioned as to the reason for the installation ... we were informed that two roof falls ... had occurred in the No. 1 entry of the North Bleeder panel," they wrote in their report. The documents say the inspectors also learned of two more roof falls at intersections of the mine, but details aren't provided of their severity. The delay in reporting the Sept. 18 roof fall resulted in a citation for contravention of s. 32.1(f) of the province's underground mining regulations, which require a report within 24 hours of an unplanned roof fall that results in conditions that include a blockage of the mine roadway, a disruption of work for more than an hour, and/or an impairment of ventilation in the mine. "This reporting had not been carried out prior to the inspection," says the compliance order issued on Oct. 11. "The employer did provide notification, after being directed to do so by the (Department of) Labour and Advanced Education, outside the 24 hours reporting period." However, Tracy Stumbo, a former chief accident investigator for the State of Kentucky, read the regulation and the safety reports and said he would characterize the rock falls reported as "massive failure" of the mine plan to secure the roof -- known in Canada as a "ground plan." "It looks to me like it should have been reported immediately," he said, noting that it appears to be the kind of roof falls that interfere with ventilation and impede traffic in a mine. "Not reporting major roof falls, that's a red flag. Why would you not report them? The law is pretty clear," said Oppegard, who has also worked for the United States mine safety regulator. However, it was fined $2,000 for an accumulation of coal dust and $2,000 for failing to implement the original roof control plan in a way that "may have provided an indication that the roof strata were exhibiting signs of potential failure." Kameron Coal, a subsidiary of a U.S.-based Cline Mining Corp., declined to specifically comment on why it didn't report the cave-ins until the inspectors arrived, though the safety reports indicate they had been taking measures to shore up the roof in the areas of the collapse. The firm sent an email attributed to Shannon Campbell, Kameron's vice president of project development, that said the company is working closely with the inspectors to resolve the issue. "Some (compliance) orders have required us to develop more robust programs such as the ground control procedure," he wrote, referring to the technical term for the plan to ensure mine roof is safe. "In close consultation with provincial regulators, international experts were brought to site to advise local management of recommended changes to reduce the likelihood of recurrence. This, along with the installation of substantial additional ground support in other areas of the mine, are steps taken to continuously improve." A July 12 inspection report cites the mine as lacking some roof support in the "North Bleeder panel," the same panel where the large cave-ins later occurred. "Several instances were noted where rock had fallen from the roof in pieces that were big enough to injure personnel," says the report. A Sept. 4 inspection report notes the roof was breaking in places where the walls met the roof "at numerous locations," adding this was occurring in areas "where roof screening was not providing full coverage." The records say that after discovering the two collapses on Oct. 3, the inspectors ordered the mines to "delay recommencing work" and asked for an engineer-approved diagnosis of the problem and a set of recommendations to prevent it from occurring again. Scott Nauss, the province's director of inspection compliances, said the department was aware of the summer and early fall problems. "From the inspection reports that I've read ... it appears that there were some warning signs in various parts of the mine that the roof was not self supporting so that there needs to be roof bolts and screens to maintain the structural integrity of the roof." He said after the failure to report the cave-ins of Sept. 18 and Oct. 1, "we took that very seriously ... this was a clear violation and we treated it as such." The province's mining inspection team approved the "corrections" made in the area of the collapses, which included more supporting systems and more monitoring of those supports, said Nauss. As with the earlier collapses, no workers were injured. The mine's licence to operate was suspended after the Dec. 28 incident, with a requirement that the operators provide a revised plan for their roof support system. However, Gary Taje, international staff representative for the United Mine Workers of America in Canada, said the company's failure to report when the first major cave-in came in September remains "a major problem." "It's not a simple little rock fall in unsupported ground. This is supported ground which has been opened fairly recently," he said in an interview. "Rock falls of this nature in a developing mine are not common at all ... that's an awful lot of material falling down at one time." The union representative says there's evidence the province should have called for an entire re-design of the roof control system after the collapses of Sept. 18 and Oct. 1. "Something different has to be come up with. The roof bolting they were doing wasn't working," he said of the mine, which his organization has been attempting to unionize. The latest area being mined is just 480 metres in a "controlled, low risk" portion of the workings, a small fraction of the area mined to date, said Nauss. "If it were assigned to me ... I would go to the mine at least on a weekly basis and observe what they're doing," he said.